It's no secret that I consider Chef Daniel Patterson to be one of the two best chefs in San Francisco (Matthew Accarrino of SPQR being the second), and just simply a culinary genius. Every interaction I've had with him has been friendly but professional, and more importantly, extremely interesting; I have no doubt that if I had the means, I would eat at Coi every week. So, you can imagine my excitement when I heard that, for a limited time only, he'd be in the kitchen at Il Cane Rosso heading up the Plum preview dinners. In case you haven't heard, Plum is his newest restaurant venture set to open in Oakland in just a few weeks, with Lauren Kiino at the helm. As a way to test the waters and experiment with what will be on the menu, Il Cane Rosso has been hosting preview dinners every Monday night (the last set to be held tonight). A meager $45 buys you a 5 course menu designed and executed by a couple of the most talented chefs in the area. Calling it "a great deal" doesn't even begin to express what an incredible offer it really is. Although I wasn't sure exactly what the cuisine at Plum would be like, as soon as I saw that the menu was full of seasonal, uncomplicated dishes meant to illuminate a particular ingredient's inherent flavor, I knew that absolutely nothing was going to stop me from going to that dinner. What I didn't realize until speaking with Chef Patterson was that roughly half of the selections were essentially recipes that came straight from the kitchen at Coi; Suddenly, for $45 I was getting some of the same dishes served at a Michelin two-star restaurant with very minor, if any, alterations. 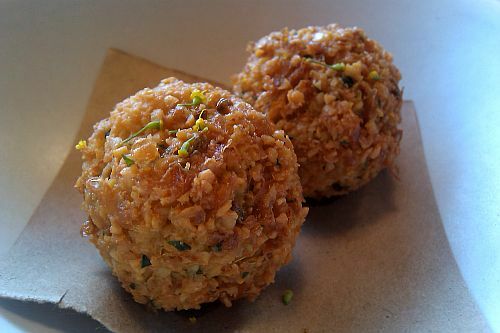 We started with a couple of Chickpea Fritters, filled with sheep's milk cheese and wild fennel. While the crust was perfectly fried and crispy, it might have been a bit too thick and mealy for my taste. But, the gooey sheep's milk that oozed out of the center provided a tangy bite that balanced the nuttiness of the fritter. 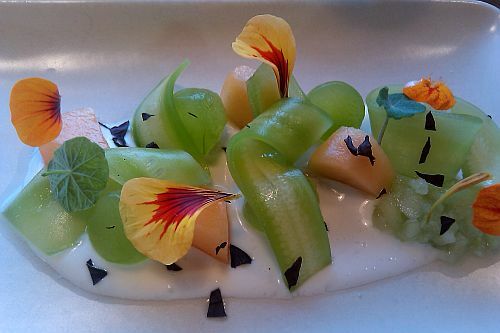 Next up was a wonderfully refreshing ode to summer: Melon & Cucumber served with an almond yogurt, red shiso, and nasturtium (pictured above). 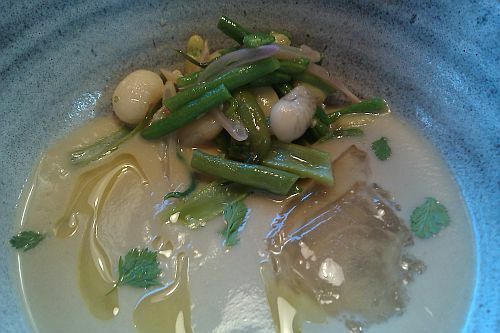 Subtle, clean flavors and an absolutely stunning presentation hinted that this dish was originally a Coi creation. Although Chef Kiino later explained that it was a bit too labor-intensive and "precious" for Plum, I was still thrilled to have the opportunity to try it in that setting. The course that followed was easily my favorite of the night, and one which I consider one of the best dishes I've tasted all year. Although it sounds simple, the Chilled Eggplant Soup with fresh pole and shelling beans, preserved lemon, and cilantro is the epitome of refined simplicity. Not being a big fan of eggplant, I was shocked to find my eyes rolling back into my head after every heavenly bite. While the flavors of each ingredient were in perfect harmony with one another, you could still taste the unique flavor that each one brought to the plate. But what really pushed this dish to the next level was the unlisted secret ingredient: tomato water gelée. This component added a shadow of the acidic, slightly bitter but sweet flavor of tomato, as well as another textural layer that put the finishing touches on a masterful dish. 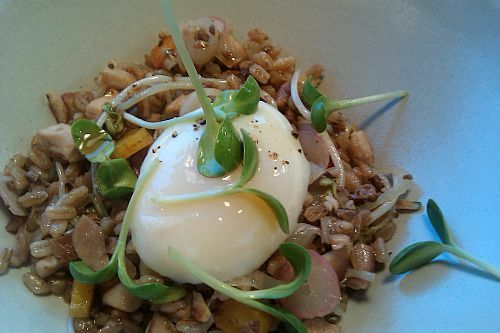 The Slow-Cooked Egg with savory chicken-giblet, fried farro, and sprouts that came next was actually my least favorite dish of the meal. 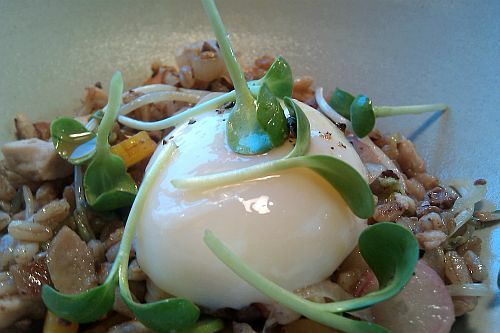 Very rustic and hearty, with a beautifully cooked egg that adds a certain richness to the dish, my only complaint was that the flavor seemed a bit one dimensional. While technically it was spot-on, a touch of acid would have done wonders in elevating the flavor. Finally, Coi's pastry chef, Bill Corbett amazed us with a Milk Chocolate Parfait served with basil meringues and pistachios. This was a dessert that made stop dead in my tracks and say, "Wow!" 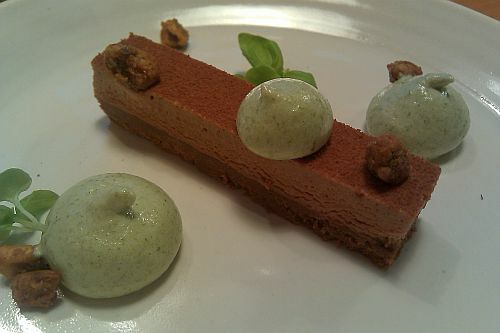 Creative in his use of basil, an herb not commonly featured in dessert, but sticking to familiar ground at the same time by pairing it with creamy milk chocolate, saving room for dessert will be a must at Plum. I left with the impression that Plum's cuisine will be a sort of middle ground between Il Cane Rosso and Coi, with the final dishes leaning more towards rustic refinement than Patterson's meticulous elegance. No matter what the final menu, one thing is clear: the cuisine will, no doubt, demonstrate each chef's ability to heighten the essential flavor of an ingredient through simplicity and balance. With that sort of talent, there's no doubt that this restaurant will be a must-try for Bay Area residents in just a few short weeks. I'm curious to find out what blog system you're utilizing? I'm having some small security issues with my latest website and I would like to find something more secure. Do you have any recommendations? I'm just using wordpress. I'm not sure about how secure it is, although there are plenty of great plugins to help catch spam comments that seem to work pretty well. For someone who knew basically nothing about creating a website, it was the platform that offered the most features/support so that's why I went for it.